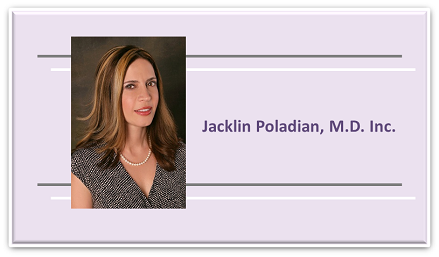 ﻿ Dr Jacklin Poladian, Inc.
My patient centered practice is all about partnering with my patients in order to help them gain better health and wellness. It is about YOU becoming a partner in your medical care and allowing me to guide you through it. It is a privilege for me to serve my patients by leading them to a better health and quality of life. I cherish the relationships that I develop with my patients, and I hope that you and I together can form a long-lasting, honest and respectful relationship that will help you achieve your best health possible. Copyright © 2012 Jacklin Poladian, M.D. Inc. All Rights Reserved.